The piles are forming as my effort to plan a year’s worth of catechism in under a week’s time. Forever an optimist my “I’ve got time” attitude has almost converted to a slacker’s get it all done at the last minute approach. What’s done today? I sorted all my photocopies back into their appropriate piles. I need to be more diligent about keeping the paper bin from getting disorganized. I have a few of my favorite props that had to be collected from my children’s toy bins. 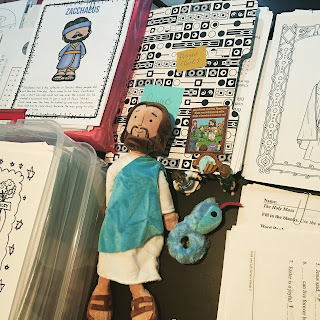 After a year of having to nearly wrestle “My Friend Jesus” from my four year old’s hands I decided to buy another plush Jesus for my classroom. He’s from Hallmark and is an absolute hit will all the kids. Our first plush Jesus is a popular guy these days often going to preschool with her so having one she can take on adventures seems like the best deal.